Perched upon the foothills at the base of the Mijas Mountains, La Cala is immersed in the natural beauty of Spain’s magnificent landscape. This spectacular, all-encompassing resort is not only the largest in Spain but one of the best golf destinations in all of Europe. La Cala features three championship courses; Campo America, Campo Asia and Campo Europa, all flowing effortlessly over the rolling backdrop the resort is set upon. Located just 10 minutes from the sun-soaked beaches of the Costa Del Sol and 30 minutes from Malaga International Airport, La Cala still feels like a secluded paradise. The 4-star hotel offers accommodation of the highest quality, with balconies or terraces overlooking the sweeping hills around you. La Cala offers a number of leisure activities to guests and features an extensive spa, plus three outstanding restaurants and two bars to complete the experience. Despite being stroke index 17, the spectacular scenery at the short, 135 yard par 3 makes for a memorable hole. The elevated tee overlooks the whole property and the panoramic view extends over the pond in front of the green, past the putting surface and all the way to the coast which is several miles away. La Cala’s Campo America Course contains some truly spectacular holes. These include the par 5s at 6, 9 and 18, and the quite remarkable par 3 at 16. The hilly topography on which the course sits means the course presents a stern test, with plenty of forced carries over steep brush-covered side slopes. Nearly three quarters of the greens are raised above the level of the fairways too, adding yet another challenge for golfers. In addition, the greens present small targets for which to aim at and are well protected by strategic bunkering, demanding accurate and well-judged shots on the approach. However, the Campo America course is made a slightly easier driving course than Campo Asia with its wide, linked fairways and relatively small number of bunkers allowing a more generous margin for error. 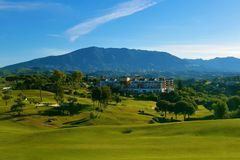 As a championship course located at the foot of the Mijas Mountains, Campo America’s international status is also enhanced by spectacular views to the Sierra de Ojén and Mediterranean Sea. Campo Asia offers many fantastic holes and after a straight-jacketing front nine, the back nine provides no let up. The par 3 at 11 is one of the most spectacular holes on the resort. The hole provides golfers with unforgettable panoramic views of the whole resort, Mijas village and Mediterranean. Despite being the oldest of the three La Cala courses, Campo Asia is still well respected by golfers, and for many it is seen as the toughest test at the resort. Its layout is even hillier, the fairways tighter and the bushes more impenetrable than the neighbouring Campo America course, which already offers a sizeable challenge. In this respect, the course certainly puts a premium on accuracy and control. While providing a tougher test off the tees, the course maintains similar elevation changes to that on the hilly America course, with strategic greenside bunkers in place at many of the raised putting surfaces. The four par 5s, with the exception of the 1st, are all reachable in two for longer hitters, but golfers should beware of the concealed contours on the greens and the water that lurks on a couple of the holes. Sometimes less can be more when it comes to the second shots here! The four short holes on the course are between 160 and 185 yards long, with three of them played from elevated tees to greens of terrific variety. This exciting course will guarantee a testing round for golfers of all abilities. The Campo Europa course provides an easier game for the average golfer, with generous fairways, flatter terrain and slightly larger greens than Campo America and Asia. However, the presence of excellent bunkering throughout and the appearance of the idyllic Ojen River on eight of the holes ensure that your course management cannot afford to be too relaxed. 14 of the 18 holes are visible from the tees, as golfers can also enjoy the fantastic views of the surrounding mountains and resort. At one point players must cross the river over an impressive 45m bridge and there are four other smaller bridges along its banks around the course as well. Campo Europa’s course is a fine addition to the resort, and is by no means a poor third, but rather a more manageable proposition for higher handicappers and perhaps beginners looking for a more relaxed test of golf. At the maximum limit of distance for a par 3, the 14th not only presents a lengthy tee shot, but a perilous one too. A long carry is needed over river and scrub, leaving little margin for error. La Cala’s practice facilities include a six hole Par 3 course which is a great place for those who wish to practice the short game, or for beginners who may not yet feel prepared for the championship courses. The course doesn’t lack quality either, and its unique par 3 designs gives cause for its ranking as the best par 3 design on the Costa del Sol. The short game practice facilities are located adjacent to the golf club house, where a large putting green, separate chipping and putting areas with two bunkers. La Cala’s clubhouse is designed in a traditional Andulacian style and is a buzzing hive of activity. The restaurant and bar provide guests with the chance of breakfast, lunch and dinner as well as snacks and drinks served throughout the day. All of the top daily sporting events are televised on the satellite TV too. The Laurel Restaurant at the Club House is open from breakfast right through to the evening. A wide range of clothing and accessories are available at the pro shop. Club cleaning services are offered, along with the opportunity to purchase personalised items. Golfers are also able to partake within the rental service of both shoes and clubs. Outside the pro shop and club house is one of the biggest golf buggy fleets in Europe, with 183 modern electric and 55 petrol buggies available for hire. On top of the stunning golfing facilities on offer, La Cala holds a squash court, two tennis courts, a fitness centre and running circuits. La Cala is also just a short distance from the Mediterranean Sea, where water skiing, sailing and kite surfing are on offer. Finally, La Cala would be pleased to organise horse riding, mountain biking or trekking on the most stunning Sierra de Mijas nature trails. Hotel La Cala holds a central position within the resort, between the golf courses. The idyllic rural retreat is built in a traditional Andalusian style and with 107 rooms, has a choice of six different room categories, all of which have views onto the golf course. Many restaurants are also on site at La Cala, each with its own unique style and character. La Terraza Restaurant, offers European Cuisine with a distinct twist and promises for a special evening, while La Bodega provides visitors with a more relaxed and informal dinner. Two bars are also available-The Pool Bar Limonda, and The Lobby Bar Naranjo. La Cala resort offers internal transfers to guests of La Cala Hotel to its La Cala Golf Academy free of charge all year round. During the summer season, there is also a free shuttle service for guests of the hotel to one of the Costa del Sol Beach Clubs in La Cala de Mijas Village. La Cala's outstanding hotel is situated centrally to ensure easy access to each of the golf courses, and provides first class hospitality for a golf holiday in Southern Spain. The architecture itself is heavily influenced by the traditional Andalucian style, and affords amazing views over the mountainous landscape that surrounds. There are 107 rooms in total, comprised of three different categories (classic room, superior room and Junior Suite), meaning that there is an option to suit every visitor. All the guest rooms and suites are complete with a terrace or balcony overlooking the golf courses and beyond, and are fitted with satellite television, full air-conditioning, safe deposit box, mini-bar and under-floor heating in the en-suite bathrooms. The tasteful decoration and intimate atmosphere at this four star hotel make every visit to La Cala a truly memorable experience. La Cala's leisure facilities include a lovely outdoor swimming pool with sun terrace, tennis courts, a well-equipped gym, jacuzzi, and a FIFA approved football pitch. Located within the hotel is the La Cala Spa complex, which is one of Spain's most comprehensive and luxurious wellness centres. Specialist packages and treatments are complemented by the Dermalogica and Anne Semonin product ranges, and the endless range of health and beauty therapies will ensure total relaxation and rejuvenation. La Terraza is a quality fine dining room, where the outstanding menu includes many local specialities in addition to international classics. Known as ‘Terraza Laurel', the clubhouse is the place for a refreshing drink or snack, overlooking the spectacular golfing landscape. The Lobby Bar includes a great terrace where you can enjoy a cocktail in the evening sun, while the Restaurant La Bodega offers guests a taste of the best selection of Andalusian Tapas.. The Salon Laurel room is ideally equipped to host private functions like prize-givings and celebrations for up to 150 people. Both my wife and I both enjoyed our stay, as you will see from the stars . The hotel is very good with comfortable rooms and balconies with great views. The SPA is excellent and the food and drinks were reasonable. All the staff were brilliant apart from the ones at the pro shop who issue you with T times and buggies. Every day there was an argument with these guys, basically we had paid for 3 and they only wished to give us 2 and kept asking for payment for the 3rd one even after I produced the paperwork! That was very disappointing and led to us being late for our times. We had a great time the food was good the ladies loved the spa they said best they have been to. Golf was excellent but pro shop far to expensive. Absolutely fantastic hotel in dream location for Golfers, We had asked for & were given rooms overlooking the fantastic vista of the Asia golf course. Lovely balcony & outside room door we overlooked the pool. Pool bar fantastic and all staff at the hotel were so friendly and helpful. The Spa was greatly enjoyed and first class. I think we would all go back to this hotel like a shot. Was given a lovely room overlooking the 18th fairway of the asia course. Only complaint was the size and quality of the towels very small and poor quality. Also not great choice of channel's on t.v. My caddy tip: "Take less off the tee,anything not on the fairway is lost..."
My caddy tip: "Love this course...always in great condition...not a long course so won't need the driver as much. Tight course so caution is better than valour." My caddy tip: "Some holes you cant see from the t box...easy to lose shots not on the fairway .."
My caddy tip: "Rewards straight shots"
My caddy tip: "Fast greens spend time getting the line". My caddy tip: "Keep it on the fairways." Very good all round experience. My caddy tip: "Keep it on the fairways". My caddy tip: "Take a range finder". Favourite hole: 10th - good par 5. My caddy tip: "Driver isn't necesarily the forst choice off the tee"
My caddy tip: "Club selection is key". Excellent - just should have been told on the second round that we wouldn't go out as a Two-ball. Favourite hole: 18th is a beautiful finish. My caddy tip: "Be prepared it is hilly". Very good set of courses. My caddy tip: "DON'T underclub the long par3 over the ravine. Easy to do." An average player will probably find this their favourite course. It's by far the easiest. Always happy with the booking process and friendly service from YGT. My caddy tip: "Leave the driver in the hotel. " My caddy tip: "Course is very hilly - definitely need a buggy." Perfect for the group we took away, restaurants we used were good, bars ok.
Favourite hole: Long par 5, tee from elevated tee, water on left hand side of green. My caddy tip: "Open your shoulders off all tees as open fairways, and really take in the course and enjoy it." Great elevations give you plenty to think about. Getting your position right is required if you are not a big hitter. Greens are very receptive so go for the flag. My caddy tip: "Keep it straight off the tee and be prepared to layup rather than going for the green." My caddy tip: "Play it safe on the tight driving holes there are plenty of easy holes where you can score". Each course at La Carla has its own uniqueness we enjoyed playing each course. My caddy tip: "Stay on the fairway"
Great course, the easiest of the three. Some great tee offs. My caddy tip: "make sure your driving is up to scratch"
Favourite hole: The first is a stunning hole with an elevated tee shot onto the Par 5 fairway that moves left to right....so as a left hander with a fade it is always a daunting start to the round. My caddy tip: "Always allow enough club when you are hitting to an elevated green"
My caddy tip: "It's a relatively short course on most holes for the better golfer so hit long irons off the tee and in particular on the hole that have a blind tee shot"
Whilst it is my favourite course at La Cala from a layout of the holes prospective I typically don't score that well on this one as it doesn't favour my "Power fade" a as a Leftie - a lot of the fairways tilt right to left and off the fairway is not good on this course As a challenge the very tough 4th hole has to be a stand out hole for me...if you play it off the normal yellow tee box before crossing the first bridge over the ravine then it's a daunting tee shot to what looks like a very narrow fairway with nothing but trouble left and not much good on the right.....if you do hit the fairway then you still have to go back over the same ravine with your 2nd shot...it can be a long hole if you don't get far enough down the fairway but for me it's a case of keeping in play and hoping to get a 5 on my card!!! My caddy tip: "If you are playing as a group then agree that the "scrub" is a lateral hazard and take a penalty drop accordingly as hitting a second shot off the tee could make it a very long round for not only your group but those behind you"
My caddy tip: "Stay below the hole"
The 3 courses at La cala are cut into some dramatic terrain. My caddy tip: "Be brave in your shot selection finding the fairways is key to a low score"
La Cala is a great venue. Three good courses, excellent facilities and a good clubhouse. A great course with many excellent holes. The 10th is a long par five all uphill which calls for three good shots just to get close to the green and the 18th is a great finishing hole. Marginally behind the Asia course in my opinion but a pleasure to play. Favourite hole: 10th hole - must hit the fairway though. My caddy tip: "Club up." My caddy tip: "Accuracy over distance off the tee"
My caddy tip: "Hit fairways"
3 very good and enjoyable courses. My caddy tip: "Play short especially the front 9"
My caddy tip: "Tight course accuracy key"
My caddy tip: "Commit as the greens hold"
Great venue, hotel & courses. Couldn't be better. We've been twice and will certainly return. My caddy tip: "A good test. Pay attention to where you place your shots to leave a sensible approach shot." My caddy tip: "It's all about the putting. Get the pace of the greens and you have a chance. Read them carefully." Your Golf Travel’s organisation for our recent holiday to La Cala was excellent and from pick up at the airport to drop off back there at the end of the trip, we did not encounter one single problem. For our group of 12 golfers La Cala was superb, with three really great courses (which suited all levels of our group) all on site so no transfers were needed to and from the courses, making it very convenient indeed. The hotel and accommodation was top value with extremely helpful and friendly staff, and it was nice to relax around the pool after each round. The Hotel prices were reasonable, but it was only a €15 cab ride into town each night and it was nice to sample some of the very good local restaurants. All in all it was a great experience, and from the feedback of all of our group, I’ve no doubts you will be hearing from us soon to book another golf holiday for next year. Too many great holes to choose a favourite. Hotel is always very good. My Caddy Tip - Hit the club that keeps the ball in the fairway. All three courses are a challenge. Need to play for position rather than bomb it. My Caddy Tip - Play for position. The hotel bar had no atmosphere. The Asia course was very tight with some greens almost impossible to hold. Other two courses were ok but not particularly memorable. The golf club bar/restaurant was good. My Caddy Tip - Take a buggy. I thought both the Asia and Europa course's were excellent. Both courses are challenging, particularly if its your first time playing. Take plenty of balls! The condition of both was excellent, you definitely need a buggy on both. Hotel was excellent, spa was fantastic, food of a good quality, staff very welcoming. My Caddy Tip - Make sure you leave yourself uphill putts as the greens are very quick. The conservative shot off the tee is the best, as these courses require accuracy. 18th on all courses were excellent, but marvellous all round. Did not stay in hotel. All holes are good and I did not have a favourite. My Caddy Tip - Just enjoy. Well worth a visit. The whole 'package' has something for everyone. You're bound to like at least one of the three courses. The hotel is excellent, the town of Mijas nearby is a nice, lively place. Overall, we'll return at some point in the future. My Caddy Tip - Don't worry about length, just stay in play! Lovely 30 minute drive from airport into the hills. On arrival the hotel looks and feels classy. If you can choose try to get a top floor room to enjoy the wonderful mountain views. We had a lower floor room but still enjoyed the tranquillity of the 18th fairway and wedding venue view. Breakfast was very nice with multi choice European food. The golf whilst sometimes intimidating, was very scenic and had great quality. Some holes seemed out of Jurassic park but were totally enjoyable. We ate a few evening meals at the hotel and they were fine. However, we discovered a local family owned a eatery about a mile down the road to the left and it was fantastic. Would I go back to la Cala? Yes. My Caddy Tip - Hit the fairways. Really enjoyed the three courses, the hotel was fine but the drinks a bit on the dear side as you would expect being held on a golf complex, My advice is to get taxis into La Cala where there are more bars and restaurants, but saying that we all had a great time. My Caddy Tip - Bring plenty of balls. Hotel was fine but a bit far from other attractions so you need a car to go to the beach, etc. Golf buggy essential for older players due to undulating terrain. Too many to name great holes to name just one. My grandsons favourites were 15 & 18. Loved the hotel set up. 3 courses and all of similar standard and difficulty. Drive carefully in the buggy due to serious slopes. My Caddy Tip - Don't walk unless fit. Everything you would want from a golf break, great hotel and good courses with amazing views and the weather was just perfect. Great value for money as well. Did not need to leave the resort. Close to airport. Take extra golf balls. My Caddy Tip - Don't forget your driver as there are a lot of carries! Hotel great. Good options for non-golfers. Partner off 28 struggled to reach several fairways from tees. My Caddy Tip - Don't be too ambitious. My Caddy Tip - Greens are slick and the grain can fool you. Although this was a lovely place we will go back to Portugal next time. 3 really interesting courses - Europa is our favourite. Hotel was great, the only slight drawback to La Cala is the distance to restaurants, shops, etc. The first hole was excellent, will never forget it. The tenth was great too! You really have to go for it. My Caddy Tip - Keep it straight. My favourite holes were the 12th on Asia, 13th on Europa and the 5th on America. My Caddy Tip - Have all parts of your game at a decent standard as all courses are different. The three courses are all brilliant, a real test especially for high handicappers like me. The main tip for a newcomer would be, keep it on the fairway, even at the expense of distance, because the rough is, well, er....rough! The greens are well maintained for a course in constent use, and very fast. I can't imagine any golfer not enjoying these courses. The hotel is well managed, the only slight niggle is the main restaurant which is beautifully set in a courtyard but very expensive, and the food is not exceptional. There are no restaurants nearby that do not require a taxi ride to reach them. My Caddy Tip - Keep your drives straight at all costs. The hotel is of a good standard. Always take a buggy. My Caddy Tip - Only bring a half set. Rooms great as we upgraded. Friendly staff. Favourite course was Europa and my favourite hole was 4 on Europa. My Caddy Tip - Don't underestimate the course. It looks open but there are many unseen dangers. Very hilly terrain, you will need to use a buggy. Restaurant very good, excellent breakfast and short drive to nearby town offered a good mix of places to eat. Hotel is very nice with a big pool and nice spa. Will visit again. My Caddy Tip - Use the course guide. Good hotel and good spa. Excellent golf. It's very much a men's golfing tour as the bar area does get loud. Only played the European and American courses as the Asia was under maintenance. Both courses were in great condition and it wasn't overly crowded with players so you could really enjoy the round. The three courses at La Cala all have their own special characteristics, with spectacular scenery from almost every hole being the one common factor. The Asia Course is a fairly tight, unforgiving 18 holes and needing a fair supply of balls for the average player to complete, I stopped keeping score at Asia after the first 9. America is a very pleasant, friendlier 18 and the Europe Course has some really good testing holes. This one let me note my best score ever, 60 net. Many holes at La Cala have considerable height variations. La Cala gives players at all levels a good test of their abilities. The course when we were there was well maintained with both fairways and greens good. We really enjoyed the golfing experience, being picky the only negative point being the bunkers filled with grit instead of sand. The hotel had very friendly and helpful staff, rooms were pretty average but acceptable. There is a very good selection of wellness facilities, mostly included in the room price; a really nice place to hang out and relax after a round of golf! Breakfast was the culinary highlight of the day and was very, very good indeed. However, disappointingly this wasn't the same in the restaurant at lunch or dinner – a very limited menu, slightly expensive and in our experience poor quality. We quickly decided that lunch and dinner outside of the hotel would be preferable. There are many tourist restaurants in the local town at the coast just a 10 minute drive away but just two minutes from the hotel there's a very good restaurant which we often frequented. Car hire is so very cheap in Spain, and we’d highly recommend this to have the freedom of your own. La Cala is an experience we are intending to repeat in the near future. La Cala America and Asia were as good as usual but Europa's greens had just been dressed and some of the mens' tees were forward especially the signature holes which was a little disappointing. Only had a coffee in the clubhouse before play on the first day as we tended to have lunch and drinks we had stocked up on in our apartment, afterwards. Had a result on the last round when the senior lady receptionist in the pro shop acceded to my request for a free buggy for being a good customer. Overall La Cala is a top venue and you only get what you pay for. On behalf of our group I would like to thank YGT for organising an amazing golfing holiday for us. The La Cala resort was spectacular. We were fortunate enough to play all 3 courses which were all in fantastic condition. The layout of the holes were amazing and having a variety of tees for different abilities ensured all our party from low to high handicappers enjoyed the experience. We cannot decide which of the courses we enjoyed the most as they were all so varied with spectacular views. The thing we were most impressed with was the friendliness of the staff. On previous trips we have felt under pressure from rangers pushing us and hurrying us even if we couldn't go any quicker due to the groups in front!! However in La Cala we had a lovely reception on the first tee and the rangers came round to ask us if we were enjoying our round and if there was anything they could do for us- so refreshing. On completion of our round we ate at the club house where they was a lovely and reasonably priced menu. We then retired to the spa which was fantastic. With a complementary 90 mins a day in the large outdoor and indoor bubble pools we felt so relaxed. We ate in the hotel for 2 evenings and down in La Cala town for 2 nights, a taxi is just 13 euros into the town. The rooms were adequate but had lovely large balconies where sat out at night which was a nice bonus. The transfers from the airport organised by YGT were great. They were there waiting for us and helped with the luggage. The drivers were really friendly and gave us lots of information about the area. Overall this has been our favourite golf resort and we have been going as a group for the last 7 years. We would definitely return and would highly recommend for any group wanting great golf and good service. We would also be more than happy to recommend YGT. I certainly won't be using anyone else to organise my holidays. As the group organiser it was hassle free and so easy. Thank you. Just a brief note to say thanks for organising our recent trip to La Cala. The logistics worked brilliantly, and everything went to plan – flights, transits and the hotel, which was up to it's usual standards. Just to cap things off beautifully the weather was brilliant. I almost felt guilty accepting the compliments from the guys for organising the trip. I have vowed I will not organise another trip. Leaving everything to you to organise was a breeze, but trying to get 7 grown up men to provide their details and money always proves to be a challenge. I know you do this for a living but would just like to let you know what a first class job you do. The fact our last trip went like clockwork ensured I came back to you this time. I have already told the guys that whoever (assuming there is another mug amongst us) organises next year's trip would be mad not to use you. Course in good condition with great views. Some narrow greens, but some par 5’ s reachable in 2 shots. Fantastic finishing hole. 8.50 tee time so no hold ups and did not see anyone behind us. Course was well maintained and as we hold 14 and 22 handicaps felt it gave enough challenges without being too difficult. Staff pleasant and efficient. Apart from to many two balls every thing was great. 13 H'cap, this is the best of the the three, most picturesque with lovely water features and again detail to bunkers and foliage perfect, can't praise this course enough really. 13 H'cap, was narrow compared to the USA course as expected, great detailing with bunker sand and foliage, great track. im a 13 H'cap and found this to be an exceptional course, attention to detail was very clever with USA type fairways bunkers and greens all very reminiscent of what i see on tv week in week out, loved it. This was the course that Our friends joined us. I beleaguered this was the best course of the 3 but that maybe I scored 38 stableford points. An excellent golf course and the best of the bunch, I would have no hesitation in recommending this to golfers of all levels. However we were all disappointed to have to argue with the staff again to get the 3 buggies we paid for! That was every day they tried to give us 2 and asked for payment for the third one! This daily debate really annoyed us and I am disappointed that it did take the shine off what was a really good complex. Found this course a bit disappointing, it was a bit shabby compared to the America course and play was very slow probably as a result of the level of difficulty. Again buggy fiasco was encountered even after we produced all paperwork on day 1. Not overly impressed with layout which is not suitable for more mature / higher handicap golfers. Not in great overall condition. Fantastic scenery. Very hilly course, so glad we had buggies. Bunkers were so different to the America Course. Instead of soft sand the bunkers were a hard gritty surface. Much better greens though. Great driving course. Scenic course, with very soft sand in the bunkers. Greens not so good. Not as good as the other two ,bunkers very difficult due to soft sticky sand. Greens not as good as the other courses. Good but greens not as good europa. Asia course was probably the best course. Rolling fairways with stunning views. In great shape and a little more water than the other courses. Not quite up to standard of the other courses but still a great course with stunning views. One big beef was that the gravel/sand in bunkers is terrible to play from around the greens. Also needs better directional signs green to tee. Fantastic course with views that will live long in the memory. Well maintained for the amount of use it gets. Could do with better directional signs from green to next tee. As usual the course in September is very busy so you can expect a slow round. Lovely friendly check in. Pleasant place.